It refers to one of the tonsils that are visually apparent on the right and left sides at the back of the throat. It is sometimes also referred to as “Faucial tonsil.”In Latin, it is known as “Tonsilla palatina”. It is round to oval in shape and is actually a lump of lymphoid tissue. These tonsils are mainly constituted by mucous membranes, nerves, veins and tiny lumps of lymphoid tissue. These also comprise of small pits, or pockets lined by epithelium, also known as crypts. Tonsils of this type are situated behind the cavity of the mouth. It is implanted in the lateral wall of the pharynx that is located on either side of the fauces (the passage between the pharynx and the back of the mouth) placed between the posterior and anterior pillars of the soft palate. 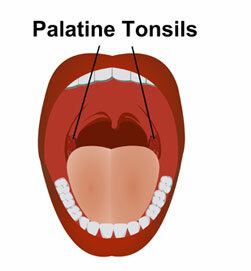 The free palatine tonsil bulges into the oropharynx. The non-keratinized stratified squamous epithelium lines the tonsil, thereby dipping into the tonsil substance while developing crypts. The number of crypts formed ranges from 12 to 15 and the opening of them all are visible on the medial surface. A crypt that is found close to the upper part of the tonsil is quite deep and enlarged and hence it is known as crypta magna or intratonsillar cleft. This crypt symbolizes the remains of the second pharyngeal pouch. On the lateral side, the palatine tonsil is covered by a well-defined fibrous tissue that forms the tonsillar hemicapsule. In the middle of the capsule and the tissue bed, there is the loose areolar tissue, which makes it easier for the tonsil in this plane to be dissected during tonsillectomy. It also serves to be the site from where pus is collected in peritonisllar abscess. The veins of the tonsil drain into paratonsillar vein, which descends from the soft palate that is found across the lateral space of the tonsillar capsule. It further pierces the superior constrictor that then drains into pharyngeal venous plexus. The lymph of the tonsil drain into the upper deep cervical lymph nodes after piercing the superior constrictor. 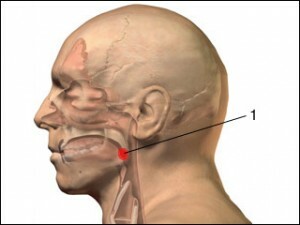 The lymph node chosen for the purpose is generally the jugulodigastric lymph node, which is commonly known as tonsillar lymph node as it is enlarged during tonsillitis i.e. tonsil infection. This node is found below the mandible angle. 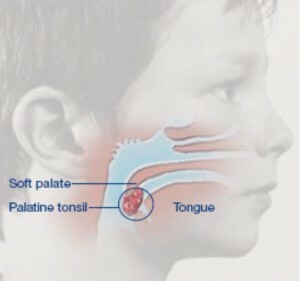 The blood supply to the palatine tonsils is done by the glossopharyngeal nerve as well as by a few palatine branches belonging to the sphenopalatine ganglion. This structure is mainly responsible for providing protection to the body from infection of the respiratory tract and the digestive system. It also assists the body in trapping bacteria, thus allowing the body the time to manufacture antibodies and destroy invading germs. These tonsils also work in collaboration with other lymphoid tissues to assist in processing and circulating lymph fluid. Acute tonsillitis is caused when acute infection affects the site. It is quite common in kids and people above 50 years of age. Viral infection is the main cause of it. It refers to an enlargement of the tonsils without any past case of Tonsillitis. It may lead to problems like pain, sleep disturbances and difficulties in swallowing. When the infection spreads through the crypts while filling it up with the purulent material in the form of yellowish spots on the crypts, the condition is acute follicular tonsillitis. It is rare but sometimes affects individuals who have been exposed to the Human Immunodeficiency Virus (HIV) or Human Papilloma Virus (HPV). Take a peek at these images to know how this throat structure appears to view.